Also, The Bacon Show just emailed me about their great new site which has the modest goal of “collecting and – eventually – cataloging every known bacon recipe”. My kind of site! Send in your bacon recipes!! Katy sent me Hats of Meat and Phyl sent me the best invention ever made: WAKE n’ BACON. In my bacon adventures, I’ve come across many bacon lifestyle products which need some press. I’ve decided to create a new section. I will call it “Bacon Lifestyle”. The latest item to be added to this new section are the Bacon is a Vegetable shirts I found on A Hamburger Today. If you see something that needs to be added, please let me know! It almost makes getting hurt fun! I, personally, would suggest getting in the car and driving up to Wild Rice for the Su Dong Wild Boar—the best pork recipe I’ve ever tasted. Have a happy, 10th birthday Aidan! Next year, you should do like me and throw yourself a Wild Boar Pig Roast Party. Biggles, this one’s for you! T-shirts, aprons, mugs, bumper stickers and more! My mom sent me four packages of bacon from the Grateful Palate for Valentine’s! The bacon arrived in Seattle today but wasn’t delivered, so I had to rescue it from the UPS distribution center. When I got home I opened up the box to find a shiny metallic bubble-wrap package. I opened that up to the intense smell of hickory-smoked bacon which nearly knocked me off my feet. The ice pack had completely melted and the bacon was on the verge of getting warm, so I had saved it just in time. Whew. I had already eaten dinner so I put the bacon in the fridge. After a few minutes, I padded back into the kitchen to check on my bacon. Yep, still in the fridge, right where I left it. After a few more minutes, I got out my Grateful Palate handbook so that I could read the description for each bacon. Then I decided I needed to take pictures of my bacon. Finally I just gave up and cut open every package and reverently removed a slice from each. Then I did something I’d never thought I’d do. I decided to microwave it. Now before anyone starts yelling about how wrong microwaving bacon is, let me just tell you why. I didn’t want to pan fry them all together because I wanted the integrity of each flavor to stay intact and not commingle. Plus I wanted each slice to be ready at the same time so I could compare and contrast. And using four pans to cook four pieces of bacon seemed ridiculous, even for me. So I microwaved. I know people swear by this method, but I really do think it’s awful. It smelled like burnt paper towels and smoke. Plus you can’t save the bacon grease for frying other things because it gets embedded in the paper towels and turns into a nasty mess. I’ll never microwave bacon again, but for the purpose of my experiment it worked out well. The slices were nicely browned and somewhat crisp. I carefully laid the bacon on my plate so that I could tell which was which. I ate half a slice of bacon from top to bottom, then I went back and ate the second half in the reverse order, taking notes along the way. 1st bite: Wow. 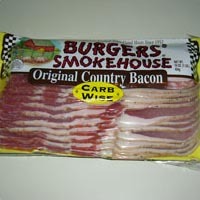 This is what REAL bacon tastes like. It’s incredibly flavorful. And Juicy. 2nd bite: Smoky, but not very sweet. 3rd bite: Kind of boring tasting, but good crunch. 4th bite: Holy crap! This is way too smoky. 5th bite: Still smoky, but now I’m catching overtones of chemicals. Overall impression: My least favorite. It tasted too smoky and had a gasoline-like aftertaste. Blech. 6th bite: This is really good bacon. Overall impression: The least smoky of the bunch, not too sweet with a really good texture. My second favorite. 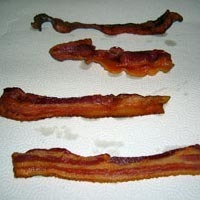 7th bite: I like the thinness and delicacy of this bacon. Overall impression: Good bacon flavor, smoky with just a hint of sweet. Thin and crisp. 8th bite: Yeah, this is definitely my favorite. Overall impression: Sweet and smoky with a strong spice that I couldn’t quite place. I am looking forward to conducting many more bacon taste-tests in the future. I want to put on my my my my my… bacon shoes! A friend just sent me a link to the most awesome footwear ever: Dave’s Quality Meat Bacon Nike Air Max 90. Oh shoot. I just checked the site again and it looks like they sold out while I was writing this. Damn. The day I anticipate all year came last night when I found the latest Grateful Palate catalog in my mailbox. Dan Philips, a.k.a Captain Bacon, is the genius behind the Bacon of the Month Club. The guy that travels all over the country to bring us the finest specimens of bacon. His Grateful Palate catalog is beautifully designed and the mouthwatering descriptions of the bacon offerings are as sophisticated as wine tasting notes. I urge everyone who isn’t already on their mailing list to sign up (the new catalog site doesn’t look like it’s up yet, but check back—it’s worth it). Captain Bacon also co-hosts Aphrodisiac Bacon Dinners for those lucky enough to live in Washington DC. Maybe I should move there. It would be like Christmas once a month. Where are all the bacon lovers? 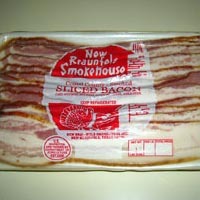 http://www.gratefulpalate.com – The best bacon catalog. Ever. http://www.ratethebacon.com – A site for bacon lovers who love to talk about bacon. http://www.baconspectator.com – Not up until Thanksgiving, but it looks promising. 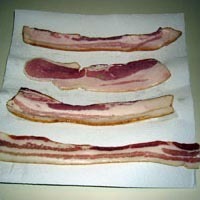 http://www.foodsubs.com/MeatcureBacon.html – Not really a bacon site, but good bacon terminology. 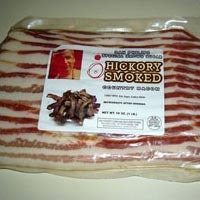 http://www.cbbqa.com/meat/pork/MakingBacon.html – How to make your own bacon. http://www.maganda.org/blog/index2.php – A discontinued :( bacon blog. http://www.danepak.co.uk/products/productsbread.html – I wish people wouldn’t defile bacon in this manner. http://www.makinbacon.com/welcome.htm – I’m sorry, but microwaving bacon is just wrong. http://www.cookingforengineers.com/article.php?id=3 – Or is it? Scientific Bacon. http://www.nudist-resorts.org/talk/topic.asp?TOPIC_ID=612&whichpage=7 – A compelling reason for microwaving bacon. http://www.cockeyed.com/inside/bacon/bacon.html – The economy of bacon. http://www.bayoudog.com/04kitchen/bacon.htm – Bacon as heroin. 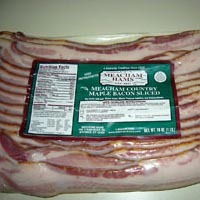 http://www.landolakes.com/mealIdeas/ViewRecipeLarge.cfm?RecipeID=11963 – What could possibly be better than bacon? http://www.indigo.org/bacon2004.html – I was about to give up on finding any more bacon links. Then I found this.